Designed by the artist who created the first tiny house pictures on our website, another tiny house creation has come to life. Using 6″ of firm natural latex, two batts of 4 lb. wool, inner twill cases, and her customer’s fabric of choice, this design represents a traditional looking couch. The curved armrests were shipped to us for layering the latex and wool inside as well as shaping that piping on perfectly. Like the couch in the first tiny house, this one can also be collapsed to be a guest bed. For more images of Pocket Mansions’ work or to hire her services, view her website here. I ordered 3 medium firm latex cushions (5″ thickness as seat back) and 3 firm ones (6″ thickness as seats) for our new sofa frame. Deborah recommended the firmness, based upon our body weights. They turned out to be very comfortable. Their cut is also exact to my specifications, so that they fit perfectly on the frame. Thank you, Deborah! 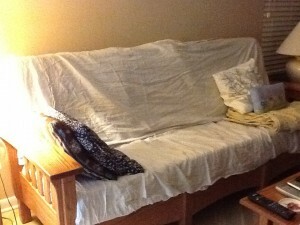 Attached is a photo of the cushions under some old sheets. I am still waiting for the cushion cases to be made by Deborah’s seamstress. Will upload another photo when all is done. Our sofa cushion cases arrived and I am so thrilled. They look wonderful! I had been a little worried about the gussets, but they turn out to be just fine. Deborah and team really went extra miles to make sure that we are completely satisfied with their products. As I said in an earlier review, these cases are for the latex cushions that I ordered from Deborah. The seat backs are 3 medium firm, 5″ thick cushions. The seats are 3 firm ones in 6″ thickness. Deborah recommended the firmness, based upon our body weights. They are very comfortable and were cut precisely to my specifications. Deborah and team, I appreciate your dedication to your work. You have won my respect! Considering the fact that all these shopping experiences are on-line, it is amazing how much trust you have earned from me. It is as if you were just a neighborhood store that we can always turn to and rely upon. Thank you so much again! 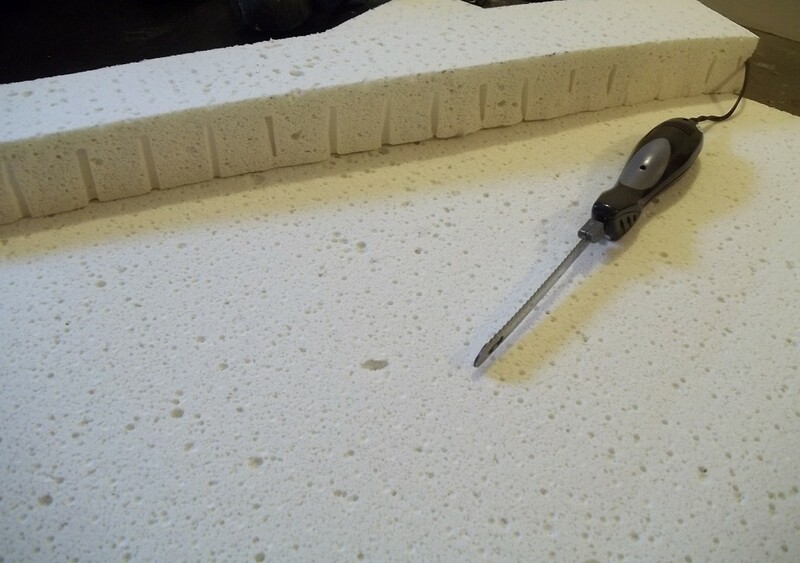 Natural latex foam can be cut to almost any size. This ability to be resized, along with its flexibility and its comfort, makes it a high-end fill to any piece of furniture. Our Arpico natural latex comes in 6” slabs and as large as 76” x 80.” Since it is Dunlop processed, the molds are as large as an Eastern King. Talalay processed mold are only as large as a Queen. 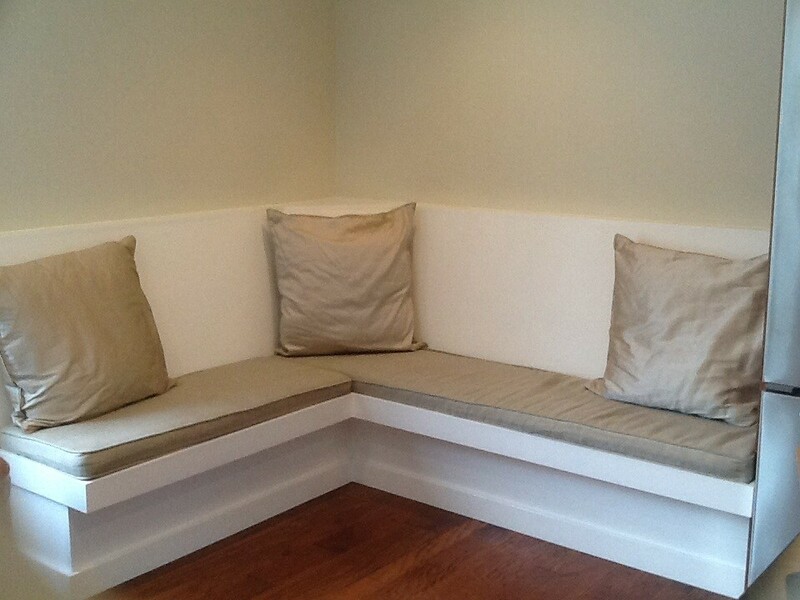 A 6” slab gives you enough depth for a couch cushion or the ability to trim it down an inch or two. To obtain a quote on a custom size, visit our Custom Cut Latex Calculator. The depth of the piece will affect your preference of firmness. A 3” extra firm or hard piece would be as thin as you would want. Four inches or five inches would be more comfortable and allow more people types to sit on it. Six inches is definitely a safe choice. A person of any weight could sit on it and not feel the slats or springs underneath it. When you get into the six inch depth, you can decrease the density of the foam to a firm if you like. A back cushion for a couch commonly is cut out of a Soft piece of latex as there is no gravity holding the sitter to it, only body weight. Why is thicker better? When a person’s weight is pinpointed directly into one spot of the latex, the pressure points are much larger than when a sleeper stretches out and spreads his pressure points out. In short, I would consider a wool wrap around your latex if using it for upholstery purposes. It is not necessary, but it has a few purposes. Besides acting as a physical barrier between the latex and the elements that cause latex to deteriorate, it also can act a little bit of the softening that a down blanket would. Consider it a way to ease into the comfortable support of latex and to reduce the bounce. It always serves to buffer the air space between the latex and the case. We do not make frames, but I have multiple customer who specialize in custom furniture, woodwork, titanium welding and metalwork. Contact me for their contact information. Send us your fabric and we can sew it up for you or we can use our fabric to sew you cases. Woven fabrics vs. knits are strong and durable for upholstery use. If you are looking for organic fabrics, there are more sources than ever before. Check out Organic Cotton Plus and note their color grown cotton fabrics as well as the hemp and wool fabrics. They also have subtle patterns appropriate for upholstery uses. GOTS organic is the best standard available but the standard has only been around a few years so it is a taking a while for many manufacturers to catch up. Organic fabric (USDA) is common, even fabric.com carries it. Cording is a decorative accent that can be added to the edges of a cushion. We can add it for you if you like. However, if your latex will be folded for display as a futon, I do not recommend cording as it will not necessarily perch properly on the edge of the latex. No need to highlight an askew seam. Another decorative accent is gussets; gussets are side panels sewing on sewn on the sides of the cushion. Pictures available on our Custom Sewing Page. According to the web, cheap sofas use foam alone. Better sofas use foam core within a down & feather blanket (wrap). The ratio of down to feathers is usually only a 10/90 ratio, but the greater the ration of down to feathers, the better. Even better sofas use a spring core encased in foam. The best of the better sofas use either a spring core that is encased in foam that is then encased in a down wrap or an all-down and feather cushion. The very best couches a use latex core with springs. In order to get this combination you would have to visit an upscale upholsterer. (Yes, customers do take our latex to such shops.) This style is rarely composed in the United States but apparently, the French do so. Good upholstery, depending upon the style, has lots of springs. There can be springs in the seat, the back, and in the arms. That’s what makes a great upholstery job look “full” and it keeps the sofa looking that way for years but it’s very expensive and usually seen only on hand made sofas. 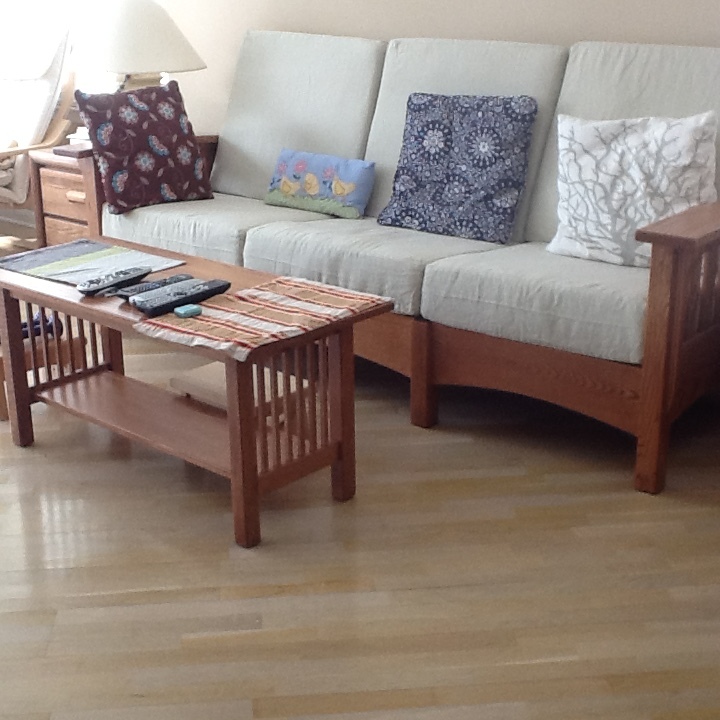 Often on these handmade sofas, you will see hand stitching as well. This upholstery company has some reupholstered pictures of before and after of some high quality piece of furniture. For more reading on upholstering tips, here is a summary article. Visit our Custom Cut Latex Calculator to get a quote on a custom cut piece of natural latex. If you want to cut your own latex, electric knives work well.